The SMC+Phase setup is simple, since reference and calibration mixers are not required. Test system calibration is achieved using a power sensor (left), a broadband comb generator (middle), and an ECal module (right) or a mechanical calibration kit. 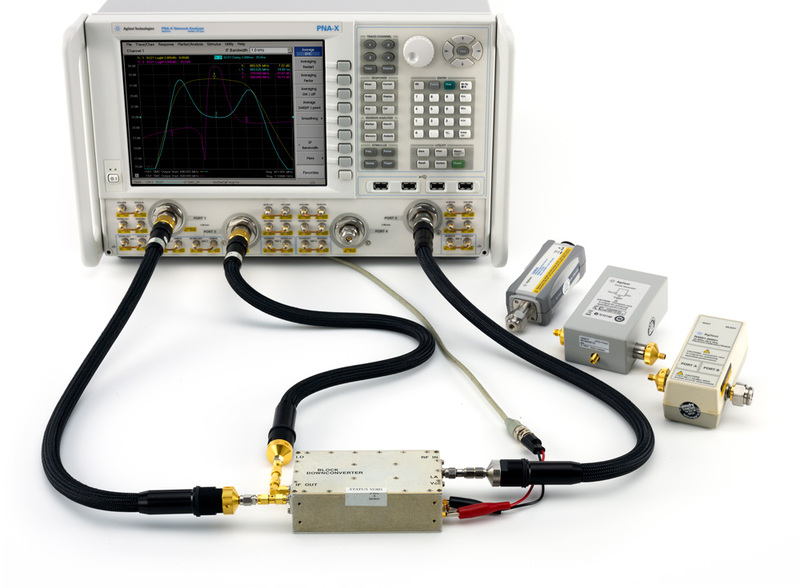 Agilent Technologies Inc. (NYSE: A) recently introduced a frequency converter measurement capability for its PNA and PNA-X Series network analyzers. With this capability, engineers now have a quicker, easier way to fully characterize mixers and frequency converters up to 67 GHz. Agilent's new frequency converter measurement solution will be available on Dec. 31 for both the PNA-X Series (N524XA) and PNA Series (N522XA) network analyzers. It will be a free firmware upgrade to current users of Option 083 (vector and scalar calibrated converter measurements). New PNA-X and PNA Series users must purchase Option 083 at a price of $11,442 to obtain the capability. More information on the frequency converter measurement solution for the PNA-X and PNA Series network analyzers is available at www.agilent.com/find/fca. A photo of the solution is available at www.agilent.com/find/MixerTest_images.